Thomas Rowland Marshall, VI, was born at Beebe Healthcare Tuesday, June 2, at 5:07 p.m. to Bridget and Thomas Rowland (T.R.) Marshall, V, of Lewes Beach. The newborn baby, called Thomas, was 22 inches long and weighed 8 pounds, 7 ounces. Thomas is the couple’s first child. He also is the fourth generation Thomas Rowland Marshall to be born at Beebe. “I was one of the first babies born at Beebe,” says Thomas’s great-grandfather Capt. Thomas Rowland Marshall, III, who was born in 1922. Capt. Marshall, a retired Delaware Bay & River Delaware Pilot, is a well-known man in the Lewes community, especially in the sailing community where he has won many national racing awards over the decades. The baby’s father T.R. and his grandfather, Thomas Rowland (Tom) Marshall, IV, both were born at Beebe. Keeping the generational connection to the sea, Tom also is an avid sailor and competes in sailing races in his spare time, and T.R. is an Able Bodied Seaman on the University of Delaware's Research Vessel R/V Hugh R. Sharp. “This was an exciting birth for our nurses on the unit when they learned that Thomas is the fourth generation Beebe Baby,” said Bridget Buckaloo, MSN, RNC-OB, Executive Director of Women’s Health. Beebe Healthcare is preparing to celebrate its 100th anniversary in 2016, when Drs. Richard and James Beebe, two brothers who were born and raised in Lewes, decided open a two-room hospital attached to their office. Beebe moved to the present location in 1921 when the Shaw Building was completed. That two-story building still stands today, surrounded by modern buildings, and is recognizable by its white pillars. Today, Beebe has 210 licensed beds and outpatient services throughout southern Delaware. As part of the centennial celebrations, Beebe would like to make contact with as many Beebe babies as possible. If you were born at Beebe, please email your name and contact information to: 100thanniversary@beebehealthcare.org. Caption: Four generations of Thomas Rowland Marshall have been born at Beebe. 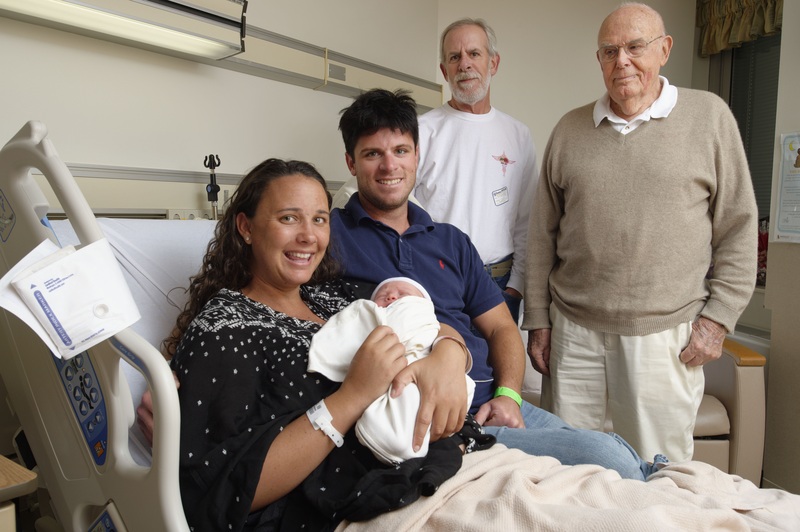 Pictured here are, left to right: Bridget Marshall holds baby, Thomas Rowland Marshall, VI, who was born on June 2, 2015; The baby’s father, Thomas Rowland Marshall, V; Grandfather, Thomas Rowland Marshall, IV; and great-grandfather, Thomas Rowland Marshall, III. All live in Lewes.